Entertain the crowd and claim your fame. Xbox One launch exclusive, Ryse: Son of Rome, will feature an online multiplayer co-op mode called "Gladiator". Two players can team up to fight hordes of enemies in one of 11 maps as the crowd cheers on the slaughter. All multiplayer takes place in a Coliseum, which features a shifting tile system so no two matches are the same. Tiles shift to change the battle and offer punishing incentives to players, such as spike traps, fire traps, and catapults. Yannick Boucher, a Project Manager on Ryse: Son of Rome gave a hands-on demo of the co-op mode. Players are supposed to work together to slay enemies and entertain the crowd. In the middle of the HUD is an entertainment meter which shows the crowd’s interest. The more entertained the crowd is, the higher your multiplier at the end of a round and the higher your fame. Players increase the meter by performing kills and completing successful executions. For an added boost in entertainment, one can taunt their enemies and hear the crowd roar. In addition to melee attacks and shield bashes, pressing the right trigger activates one of four God Powers available in the multiplayer mode. The video showcased the Jupiter power, which pushes back enemies and stuns them, creating a perfect opportunity to attack. While "Gladiator" claims to be a co-op mode, we've seen very little actual co-op gameplay. It appears that both players are acting on their own and we've yet to see some real cooperative teamwork. Ryse: Son of Rome launches exclusively on Xbox One in November. 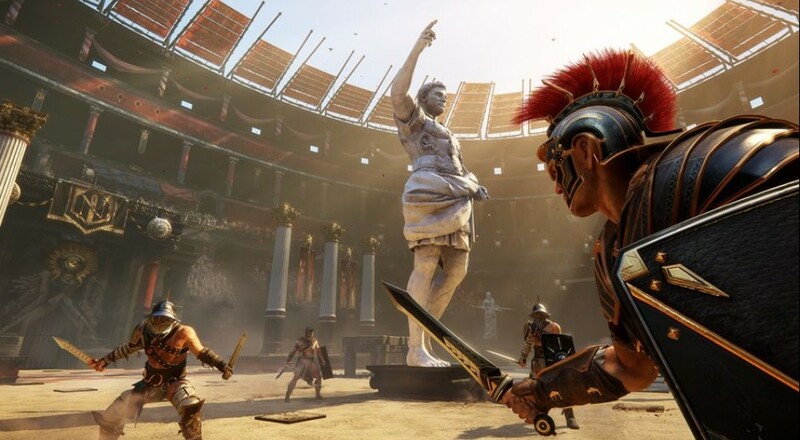 Will you be entering the Coliseum with a friend to fight off the onslaught of enemies? Let us know in the comments!